A 1961 Royal Enfield Fury motor, found in the frame of a Royal Enfield made Indian twin. Fifty years ago Tim Janowiak heard of an old motorcycle in a barn in Michigan. He bought it, ran it hard, then put it in the basement. Only decades later did he discover that it was a special Royal Enfield: A 1957 Indian Trailblazer 700cc twin frame, with a 1961 Royal Enfield Fury 500cc single engine. "I've finally gotten it running after about 20 years in the basement," he wrote me. "I started riding bikes around the corn fields of Northern Indiana at about the age of eight, starting on a Sears moped. I graduated to larger ones and a group of us built a very nice track to AMA specs, which was used heavily by kids from the South Bend area. "At the age of about 15 in 1969 I was told of a unique motocross bike on a vineyard in Buchanan, Mich. near Red Bud Trail, one of the premier motocross tracks in the States. I immediately went to look at it and met the owner, Csaba B. Bikfalvy, who took me to an old barn to show me a 500 Royal Enfield... which I had never heard of, but was sold instantly. "We agreed to a price of $50 or $100 — which I can't remember — and I took it home to terrorize the other kids riding on the track, amazed at its power and speed. "I rode the bike for many years, never having to do anything mechanical except change the oil and plugs; but it shows signs of hard riding before I purchased it. "She was finally parked in the basement after our track was turned into a housing development, and sat for about 25 years until last spring I decided it was time to breathe life back into it. "I brought it upstairs to replace cables and other small parts, which were to be ordered through Hitchcocks, and realized some parts didn't seem quite right." Tim contacted Graham Scarth, chairman of the Royal Enfield Owners Club UK. The club has a collection of Royal Enfield factory records. 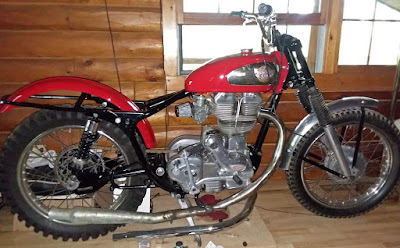 "I got back a very nice but simple letter stating that it is a 1957 Indian Trailblazer 700cc twin frame, with a 1961 500cc Fury single engine." Royal Enfield enthusiast Chris Overton, a Fury owner himself, was able to provide information about how rare the Fury motor is. "1959 and '60 were the big years of Fury production," he wrote, "if 156 500cc and 10 350cc versions is big. "In calendar 1961 there were 11 dispatched. (The model year of September to August hardly seems relevant for this low production machine produced without much variation.) In 1962 there were four dispatched, and 22 in 1963." Chris wasn't surprised at the mix-and-match frame/engine numbers of Tim's Fury. The factory, dealers and individual owners didn't hesitate to swap interchangeable parts. "Motives were performance, experimentation, customization, desperation..."
"It differed from the Bullet by having a larger inlet port, an Alfin aluminum alloy barrel with cast liner (instead of the Bullet's iron) and a higher compression piston (8.9:1 instead of 7.3:1)... The 500cc boasted a 40 bhp output, up from the UK models' production of 27 bhp." Chris noted that the prefix letter "A" on the gearbox of Tim's Fury "indicates the coarser, stronger gears suitable for such a powerful engine." He advised a gentle throttle hand, as the top end of a Fury motor could produce more power than the bottom end liked, advice Tim has taken to heart. "She is still a blast to hit the trails on, though at a much slower pace, and guess we'll keep riding 'til one of us dies," Tim wrote. "I tried to contact Csaba and Red Bud to see if I could find out anything on its racing history, but was unable to. I am looking for a solo seat, gas petcock and head steady for it if anyone knows of parts close by." This was a great story, David. Thanks for posting this one. Excellent article David and I'm still learning about the "Fury".